That was until I learned how easy it actually is to make it a reality and check off your list. And, thanks to Orlando Balloon Rides, I was able to surprise my family with a check off their list as well. Maybe they didn’t even know it was on their list, but after our trip, I’m sure it was. Mom even said its something she never thought she would ever do…and they were all so happy we did. 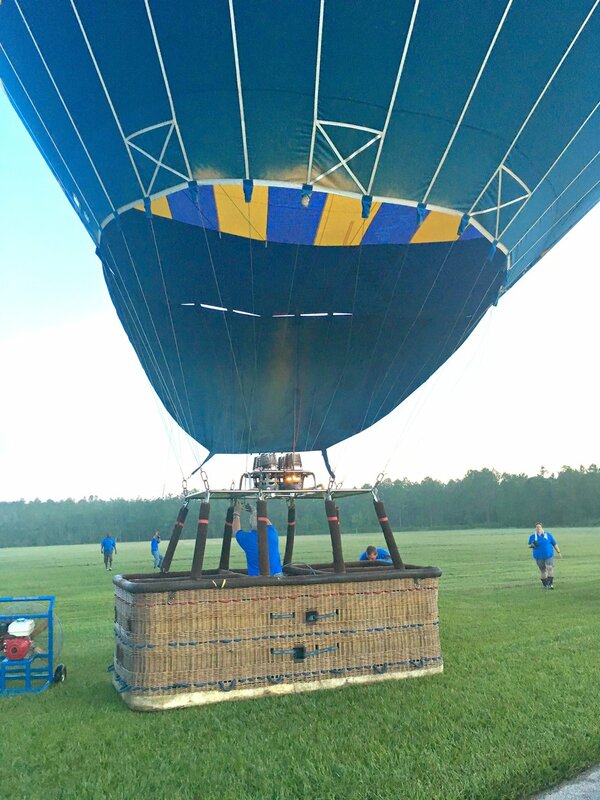 Orlando Balloon Rides makes it possible and so very easy to get a hot air balloon ride checked off your list. They have flights out, not only on weekends, but on the weekdays as well. We took advantage of the weekday specials and picked a day to go on our trip. There were around 30 people there that morning, so 2 balloons went out. The baskets are divided into 4 sections that can hold 4 people each. A lot bigger than I had expected, but it was actually really cool. We met at their office location, filled out our waivers, and loaded into a couple vans, where they took us to the “launch area”, which is just in a field. It was so cool to watch the balloons fill up so big with the hot air from the fire. As soon as they were filled up, we all stepped into the baskets, they took a quick picture, and before we even realized what was going on, we were already floating up in the air. It’s kind of crazy to think that a balloon, just filled with hot air is carrying all those people, but not once did we ever feel unsafe. Riding in a hot air balloon is such a peaceful experience. You are up in the sky, floating above the city, and all you are listening to is the fire going up into the balloon whenever the pilot thinks it needs more, or wants to go higher. It was such an awesome experience to share with my family. After the flight, we helped pack up the balloon, and went back to the office for a Champagne toast and some snacks. If you’ve ever thought about wanting to possibly ride in a hot air balloon at all, definitely check out Orlando Balloon Rides next time you are in Florida. You can make it a day you won’t ever forget!